It is that time of the month when we have to let you know which one of the authors was most popular with you, the readers, during the month when the previous issue was live. And here we are with the news. First of all, let me tell you that between May 15 and June 14 inclusively, we were lucky enough to have had 47,795 readers visiting our magazine. We think that the issue that was published on June 15 will bring more visits as we have already had 6,522 visits on the site and the second day is not over yet. Now, the moment you have been waiting for: the prizes. I am sure you will be as stunned as we were seeing the results. We thank you all for reading and we thank all the poets and writers for contributing with their work and making the review as it is. We are very proud to have had the chance of publishing some of the best literary pieces that are out there. A new month begins and it is the moment to take a look behind at the month that has already past and a look ahead, the same time, and see what is going to come. 1. For the entire month of May, the review had 43,144 readers, and only during May 15 and May 31, 28,843 people visited the site and read the poems and stories featured in the May issue. 2. For the first time since launching, one author had an amazing number of readers: up to yesterday inclusively, 5,723 people read this author's work. We will not reveal who this one is, as we don't want to spoil the surprise when announcing the May issue winners for poetry, short-stories and essays. So, lots of news books out there, what do you think? 4. 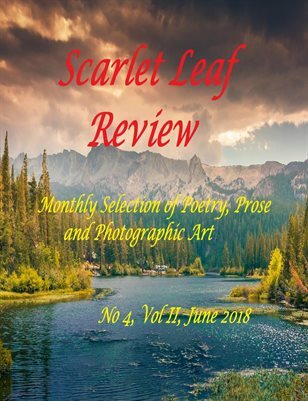 Soon, three anthologies will see the light of print (and of the electronic world, as well): Scarlet Leaf Review Poetry Anthology; Scarlet Leaf Review Short-Story Anthology; Scarlet Leaf Review Essay Anthology. 5. We had the results for the short-story competition with three winners. You can read the stories if you click on the AWARD header from the menu. Don't forget, soon, we will have a poetry competition! A lot of good things, don't you think? ​ So, keep an eye on the magazine and continue reading. Our excellent authors do deserve to be read!